One of the best things about playing piano by ear is that you can usually just sit down and play without having to give thought to what you’re playing. Most pianists, unfortunately, don’t really focus on this because they tend to get caught up in the need for sheet music that can stifle musical expression. It’s what’s comfortable to them and what they learned, so they don’t stray from it. Here’s how you can avoid doing the same. A good first lesson to start with is chord structure and music structure. To be able to improvise music, you have to understand the rules behind it. There’s a term in Western (American and European) music that’s called tertian harmony. This means intervals of three; notes are all an interval apart. I’m going to skip the explanation of notes and intervals. Suffice to say, intervals are one note apart; C, D, E, etc. Tertian harmony means, then, that the chords are based on intervals of three. The C major chord, for example, is based on C, E, and G – all third intervals apart. Chords are made of notes in a scale. Using the C major scale and chord, you can look at the chord and see that the scale goes C, D, E, F, G, A, B, and C. You can figure out the chord by looking at those intervals. Building chords on top of one another and their quality (major or minor) is determined by the scale. So, we know the C major chord – the F major chord as another example would be the notes F, A and C, and A and C also come from the C scale. You can overlap chords like this to create a rather nice effect, depending whether you go major or minor. You wouldn’t use any accidentals like G# or Eb, because they’d make the chord sound very dissonant. Of course, if you want that effect, use it, but be sure you can do it well otherwise it just sounds like you don’t know how to play. Trust me, I know this from experience and it isn’t pretty. You could do the same with a G major chord. C, F and G are the most common ones, but I also like D. Here you’ll use F# as the third interval. To find out chord notation for an easy piano lesson, you can think of all chords as being referenced to C. So, a C chord will be noted as 1. D would be 2, E would be 3 and so forth. Most songs will use only a few chords, because they repeat and provide a nice counter to a main melody. Once you learn the various types of scales, you can improvise with the scales along with the chords as a backup sound. The most common chord progressions are 1,4,5 and 4,5,1. If you understand the progression of chords, you can figure out how to match the right scale progression to it to make your improvised songs sound like they’d been rehearsed beforehand and not just improvised. This lesson is great if your going to play piano in your church , or just need to know a few basics of the piano. 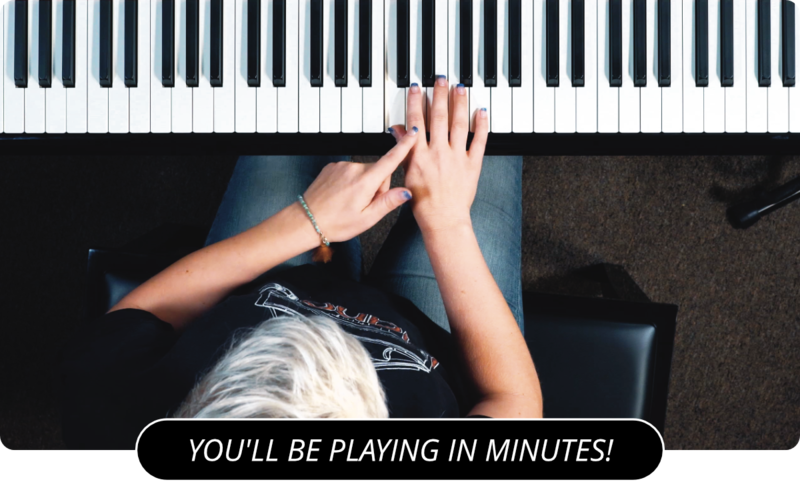 If you feel that your ready to take on some sheet music your going to need to know what kind of piano books you'll need and how to get started with piano lessons. Learn more about easy piano lessons without sheet music by visiting the main page of PianoLessons.com , or by going through some of our other piano lesson articles that we've posted on this web site.